Originally published under the title, "Turkey's Islamist Factory Settings." 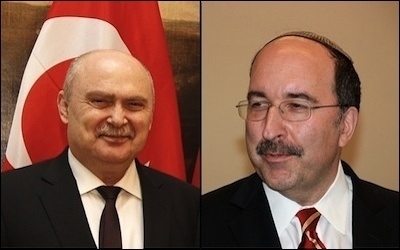 Israeli Foreign Ministry Director-General Dore Gold (right) reportedly held a secret meeting in Rome with Turkish Foreign Ministry Undersecretary (now Foreign Minister) Feridun Sinirlioglu. Israel-bashing and the systematic fueling of anti-Semitic behavior have become a Turkish political pastime since Turkey downgraded its diplomatic ties with Israel in 2010. There has been, though, relative tranquility and reports of a potential thaw since June 7, when Turkey's Islamist government lost its parliamentary majority for the first time since it rose to power in 2002. In August, a senior Hamas official, apparently hosted for some time by an all-too-affectionate Turkish government, vanished into thin air. 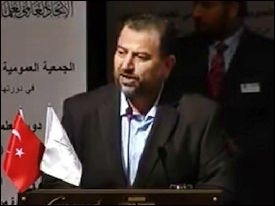 Saleh al-Arouri, a veteran Hamas official and one of the founders of its military wing, the Izz ad-Din al-Qassam Brigades, was forced to leave Israel in 2010, after serving more than 15 years in prison. After his release, he was believed to be living in Istanbul. In August 2014, at a meeting of the International Union of Islamic Scholars in Istanbul, al-Arouri said that Hamas was behind the kidnapping of three Israeli teenagers in the West Bank, an incident that triggered a spiral of violence in Gaza and Israel that summer. A year later, Turkish diplomatic sources said that "Arouri was not in Turkey" although they did not confirm or deny earlier reports that Turkey had deported him. Earlier than the news about Arouri, top diplomats from the two countries had secretly met in Rome. Dore Gold is Israel's Foreign Ministry Director-General, and his Turkish counterpart was Feridun Sinirlioglu, then the Turkish Foreign Ministry's undersecretary. Sinirlioglu is a career diplomat, not an Islamist political appointee. Between 2002 and 2007, he served as Turkey's ambassador to Israel. On June 24, Turkish Foreign Minister Mevlut Cavusoglu confirmed ongoing talks with Israel, aimed at reaching some form of rapprochement, while suggesting that undue emphasis should not be placed on the gatherings. Fast-forward to August: Turkish Prime Minister Ahmet Davutoglu forms an interim cabinet to take the country to snap elections on Nov. 1, and Sinirlioglu becomes Turkey's new Foreign Minister. One of the first to send his congratulations to Sinirlioglu was Dore Gold. I have to say that many people in different capitals asked about the Rome meeting and ... I heard the highest praise whether I was in a European capital or speaking to American officials about his diplomatic skills ...Turkey is very lucky to have him [Sinirlioglu] as foreign minister. He is a first-class diplomat. Apparently, reason had gained a bit of the upper hand after Turkey's parliamentary elections in June. It is, no doubt, in the best national (and rational, too) interests of both countries, which once were best regional allies -- before the Islamists rose to power in Turkey in 2002. A normalization of relations with Israel could bolster efforts to balance Iran's growing regional clout. It could as well help keep Gaza relatively peaceful, stable and economically more viable. But in the Middle East, reason does not always overcome holiness. Israel, Jews, Hamas, and "our Palestinian brothers" remain a few of the most popular themes in Islamist election rallies -- the best ones to exploit a Muslim voter base. Things between the two countries look relatively calm these days, but a fresh round of attacks from Turkey's Islamist politicians during election rallies is not unlikely. An Israeli official was right when he told this author recently: "In the Middle East, everyone at some point realizes that there is a bigger enemy than the big enemy." If the AKP fails to win a parliamentary majority, it will be forced to compromise on its Islamist policies. Turkey and its best regional (Sunni) ally, Qatar, may have come to understand that they are paying a price for unconditionally supporting Hamas, and sometimes abusing this support. Apparently, there are some signs of a potential change in the Turkish-Qatari solidarity with Hamas. But caution is required. No one is sure yet if those signs indicate a medium-term policy change. Jerusalem is not unaware of the risks of reaching premature conclusions about any normalization with Turkey. Prime Minister Netanyahu has every reason not to trust Turkey's dominant pro-Sunni, pro-Hamas, and anti-Israel Islamist polity. He knows that any normalization may collapse in a matter of months if the Turkish Islamists decide to start a new fight with Israel. Both countries would look ridiculous if they have to withdraw their ambassadors once again two months, say, after they were appointed. Turkish behavior in the event of normalization would be unpredictable. But it would also depend very much on the election results on November 1. If, as in June's elections, PM Davutoglu's ruling Justice and Development Party (AKP) fails to win a parliamentary majority, it will be forced into a coalition government with one of the three opposition parties, with the social-democratic Republican People's Party (CHP) appearing as a likely prospective partner. The AKP will have to compromise on its Islamist policies, including foreign policy -- particularly in the Middle East. The AKP would be reluctant to surrender foreign policy entirely to any coalition partner but may be lured into a compromise in which someone such as Sinirlioglu (the experienced diplomat and presently interim foreign minister) may be the solution satisfying everyone. But the opposite is also true. In case of a landslide AKP victory on November 1 and a single-party government, all Middle East policy, including relations with Israel, could have to be reset to the Islamist factory settings. Perhaps the headline in Zaytung, an online humor magazine and a Turkish response to The Onion, explains it all: "The Foreign Ministry, which has neglected its routine work due to civil strife in the country, gave signs of a return to normality when it condemned Israel."